The entire month of September is dedicated to the arts here in Brisbane. The entire city is painted pink because Brisbane Festival has arrived. Throughout the entire month, everyone is invited to attend various performances and events that include music, dance, theatre, circus, cabaret, comedy, visual art, and more. Some events are free while others require bookings. Free events included the Santos GLNG City of Lights show, Sunsuper Riverfire, Wunder Bar, and the Stormie Mills Project that was a big favorite of mine. 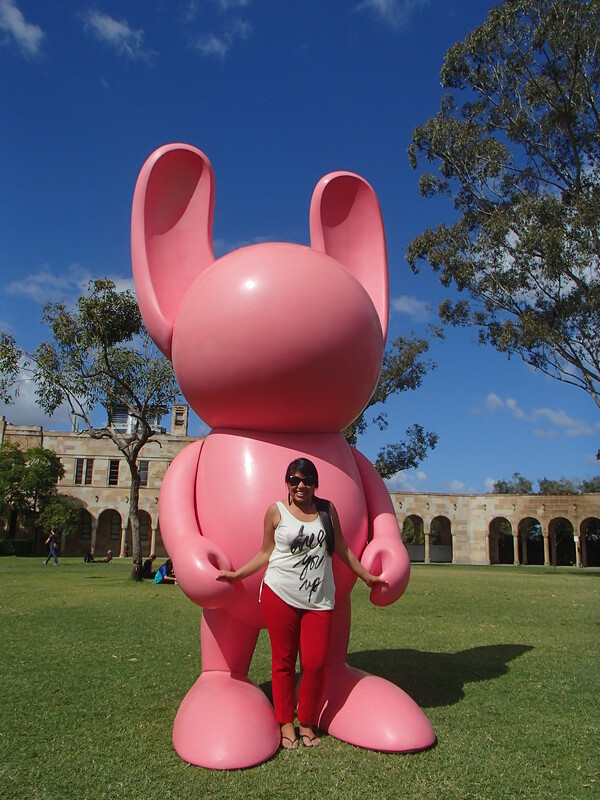 Stormie created four metre (over 13 feet) tall bright pink bunnies that popped up all around the city, including UQ’s Great Court one morning. I attended several Brisbane Festival events including Symphony Under the Stars where the Queensland Symphony Orchestra (QSO) performed well-known classical pieces and also premiered An Australian in New York from celebrated Australian composer, Sean O’Boyle. My friends and I brought blankets, wine, and cheese to enjoy while listening to the violins, trombones, and cymbals! Boy do I miss my orchestra days playing the violin. Then, I attended Urban which was a Queensland premiere that came from Colombia and the United Kingdom. This was a circus show that included dance, acrobatic segments, and live singing that shared the cast members’ real-life stories of happiness but also struggle with physical violence that disrupted their lives in Cali, Colombia. The music focused heavily on reggaeton and Latin hip hop. Every cast member was super fit and were so kind to chat with us after the show and even take a few photos! 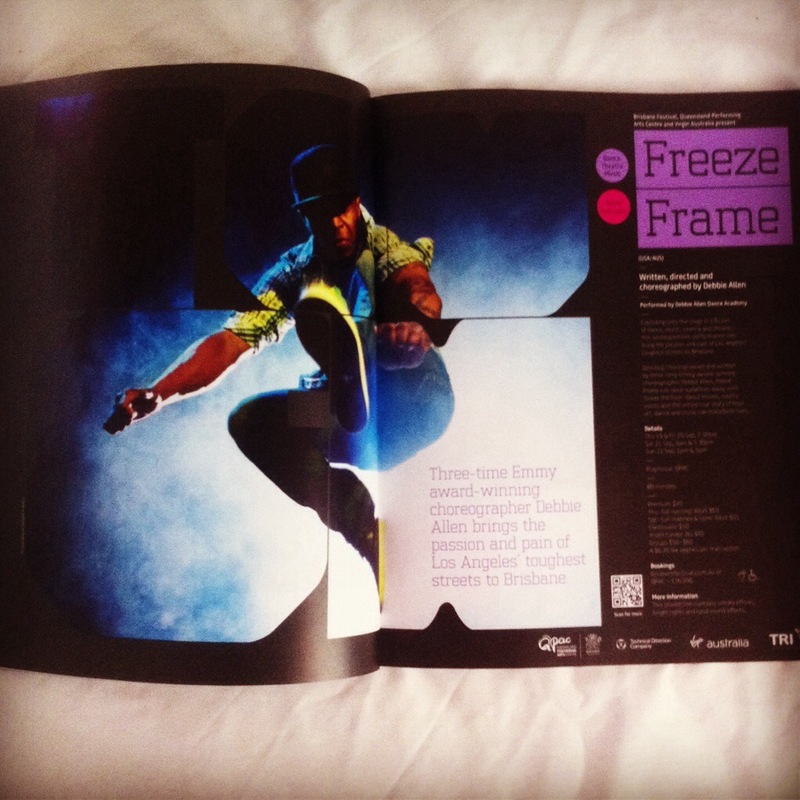 A few days later, an awesome collaboration between two artists, an Australia and American made the world premiere of the Freeze Frame performance come to life! Written, directed, and choreographed by Debbie Allen, who is famous in the acting and arts world and a three-time Emmy award-winning choreographer to boot but for those who don’t know her, she is Bill Cosby’s wife’s (Phylicia Rashad) sister in real life. This was a world premiere performed by the Debbie Allen Dance Academy. It was a fused performance that included dance, music, cinema, and theatre that shared the realities of the roughest streets in Los Angeles. I wish I could dance and move my body like the performers. Can I be that agile overnight? It would probably help if I stretched. The performers ranged from seasoned professionals to upcoming talent that demonstrated how the arts can make a positive impact on your life at every age and how the arts can transform at risk individuals. Many stories intertwined in the musical such as the preacher’s son who wanted to be a rapper instead of following in his father’s footsteps and the young girl who was insecure about her appearance. The music bounces between hip-hop, soul, gospel, and R&B keeping it upbeat even with heavier topics. To top if off, Sunsuper Riverfire closes the festival with a bang! First, aerial displays of super hornets and helicopters happen for a few hours and then the incredible fireworks show meshes up with a soundtrack that included Lohengrin, Act 3 Vorspiel by Wagner, It’s Time by Imagine Dragons, Livin’ on the Edge by Aerosmith, and Feel the Love by Rudimental. I can’t imagine my life without the arts! Thank you Mom and Dad for wanting and letting me learn how to play piano and violin when I was young. September is a great time to visit Brisbane because you couldn’t be bored if you wanted because the city is buzzing. Spring and the arts have arrived here in Queensland. Here are some photos from the various Brisbane Festival events I attended! Wow, sounds like a fantastic month to be in Brisbane. Should we come and visit you then? Haha! Thanks for sharing all the wonderful events and the festivities. You’re so awesome! Yes, I wish you could come visit me every other month. Thank YOU for reading my blog. It means the world to me.